Dominus Cancellarius declaravit præsens Parliamentum continuandum esse usque ad et in diem Lunæ, decimum tertium diem instantis Junii, hora undecima Auroræ, Dominis sic decernentibus. Ordered, That the Thanks of this House be given to the Lord Bishop of Norwich, for the Sermon by him preached before this House on Saturday last, at the Abbey Church, Westminster; and he is hereby desired to cause the same to be printed and published. Message from H. C. to return Baratty's Nat. Bill. 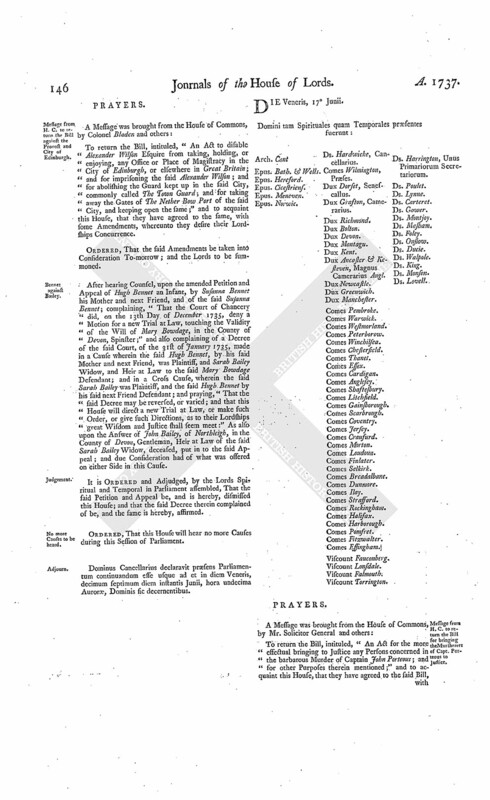 To return the Bill, intituled, "An Act for naturalizing Bartholomew Baratty;" and to acquaint this House, that they have agreed to their Lordships Amendments made thereto. The House being this Day informed, "That the Matters in Difference in relation to the said Complaints and Petition were accommodated:"
Committee of Privileges discharged from proceeding on it. It is Ordered, That the said Committee be discharged from proceeding upon the Matters of the said Complaints and Petition. and Carter against Marion, &c.
Jane Carter is Plaintiff, and Margaret Maryon, &c. Defendant. Ordered, That the Plaintiff in the Writ of Error last mentioned do assign Errors upon the said Writ, on or before Thursday next. A Petition of William Parkin Gentleman and Paul Parkin his Brother, an Attorney at Law, both in Custody of the Serjeant at Arms attending this House, for a Breach of Privilege against the Earl of Strafford, was presented, and read; acknowledging their Offences, having made their Submission to the said Earl, and begged his Pardon; promising to repair the Damages by them done; and praying Pardon of the House; and that they may be ordered to be discharged out of Custody, that they may return into the Country, to follow their Affairs. Parkins, discharged, without coming to the Bar. 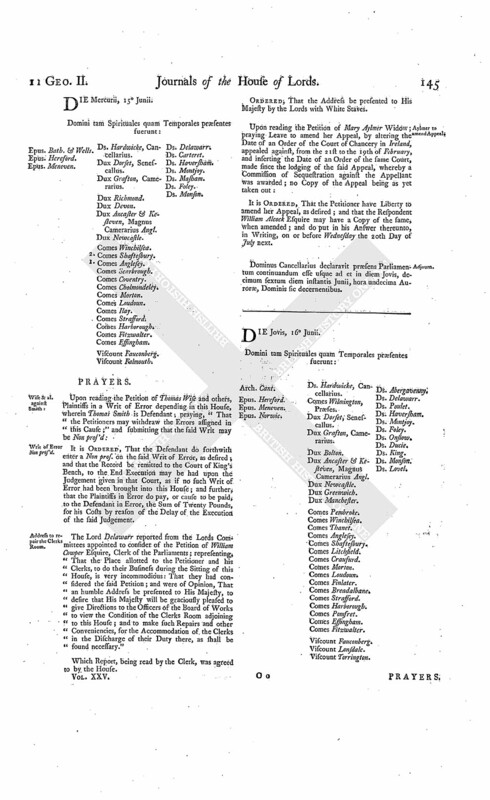 And the House being informed, "That the said Earl had no Objection to the granting the Prayer of the said Petition:"
Ordered, That the Petitioners be discharged out of Custody, paying their Fees. Dominus Cancellarius declaravit præsens Parliamentum continuandum esse usque ad et in diem Martis, decimum quartum diem instantis Junii, hora undecima Auroræ, Dominis sic decernentibus. Upon reading the Petition of Thomas Smith, Defendant in a Writ of Error brought into this House the 3d Day of this Instant June, wherein Thomas Wise and others are Plaintiffs; praying, "In regard the Plaintiffs have alleged Diminution, (videlicet,) the Want of a Warrant of Attorney for the Plaintiff in the Judgement, and prayed a Certiorari; that they may be forthwith required to return such Certiorari, so that this Cause may come on to be heard some Time this Session." The Agents on both Sides were called in. Return of a Certiorari, no Diminution alleged. It was moved, "To dispense with the Standing Order of this House, which allows Ten Days Time for the Return of a Certiorari after Diminution alleged, in regard to the approaching Conclusion of this Session of Parliament." Ordered, That the Committee to whom the Bill, intituled, "An Act for making navigable the River Rodon, from a little below a Mill called Barking Mill, in the County of Essex, to Illford Bridge, in the said County," stands committed, be revived; and meet on Thursday next. Upon reading the Petition of Hugh Bennet, an Infant, by his Mother and next Friend; setting forth, "That the Petitioners Counsel, in the Cause wherein they are Appellants, and John Bailey is Respondent, which stands to be heard To-morrow, are not then able to attend;" and praying, "That the said Hearing may be adjourned to Thursday next, or such further Day as to the House shall seem meet." The Agents on both Sides were called in, and heard at the Bar. Ordered, That the further Hearing of the said Cause be adjourned to Thursday next. Dominus Cancellarius declaravit præsens Parliamentum continuandum esse usque ad et in diem Mercurii, decimum quintum diem instantis Junii, hora undecima Auroræ, Dominis sic decernentibus. Epus. Meneven. Ds. Hardwicke, Cancellarius. Upon reading the Petition of Thomas Wise and others, Plaintiffs in a Writ of Error depending in this House, wherein Thomas Smith is Defendant; praying, "That the Petitioners may withdraw the Errors assigned in this Cause;" and submitting that the said Writ may be Non pros'd. It is Ordered, That the Defendant do forthwith enter a Non pros. 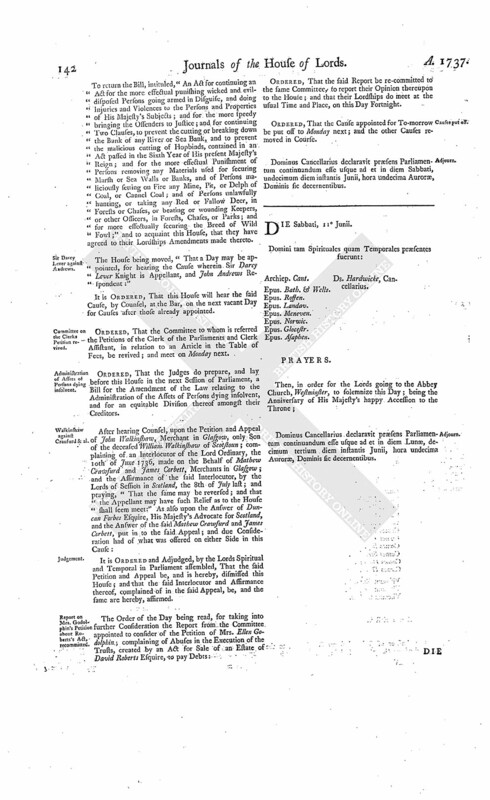 on the said Writ of Error, as desired; and that the Record be remitted to the Court of King's Bench, to the End Execution may be had upon the Judgement given in that Court, as if no such Writ of Error had been brought into this House; and further, that the Plaintiffs in Error do pay, or cause to be paid, to the Defendant in Error, the Sum of Twenty Pounds, for his Costs by reason of the Delay of the Execution of the said Judgement. Address to repair the Clerks Room. The Lord Delawarr reported from the Lords Committees appointed to consider of the Petition of William Cowper Esquire, Clerk of the Parliaments; representing, "That the Place allotted to the Petitioner and his Clerks, to do their Business during the Sitting of this House, is very incommodious: That they had considered the said Petition; and were of Opinion, That an humble Address be presented to His Majesty, to desire that His Majesty will be graciously pleased to give Directions to the Officers of the Board of Works to view the Condition of the Clerks Room adjoining to this House; and to make such Repairs and other Conveniencies, for the Accommodation of the Clerks in the Discharge of their Duty there, as shall be found necessary." Ordered, That the Address be presented to His Majesty by the Lords with White Staves. It is Ordered, That the Petitioner have Liberty to amend her Appeal, as desired; and that the Respondent William Alcock Esquire may have a Copy of the same, when amended; and do put in his Answer thereunto, in Writing, on or before Wednesday the 20th Day of July next. Dominus Cancellarius declaravit præsens Parliamentum continuandum esse usque ad et in diem Jovis, decimum sextum diem instantis Junii, hora undecima Auroræ, Dominis sic decernentibus. Message from H. C. to return the Bill against the Provost and City of Edinburgh. To return the Bill, intituled, "An Act to disable Alexander Wilson Esquire from taking, holding, or enjoying, any Office or Place of Magistracy in the City of Edinburgh, or elsewhere in Great Britain; and for imprisoning the said Alexander Wilson; and for abolishing the Guard kept up in the said City, commonly called The Town Guard; and for taking away the Gates of The Nether Bow Port of the said City, and keeping open the same;" and to acquaint this House, that they have agreed to the same, with some Amendments, whereunto they desire their Lordships Concurrence. Ordered, That the said Amendments be taken into Consideration To-morrow; and the Lords to be summoned. After hearing Counsel, upon the amended Petition and Appeal of Hugh Bennet an Infant, by Susanna Bennet his Mother and next Friend, and of the said Susanna Bennet; complaining, "That the Court of Chancery did, on the 13th Day of December 1735, deny a Motion for a new Trial at Law, touching the Validity of the Will of Mary Bowdage, in the County of Devon, Spinster;" and also complaining of a Decree of the said Court, of the 31st of January 1735, made in a Cause wherein the said Hugh Bennet, by his said Mother and next Friend, was Plaintiff, and Sarah Bailey Widow, and Heir at Law to the said Mary Bowdage Defendant; and in a Cross Cause, wherein the said Sarah Bailey was Plaintiff, and the said Hugh Bennet by his said next Friend Defendant; and praying, "That the said Decree may be reversed, or varied; and that this House will direct a new Trial at Law, or make such Order, or give such Directions, as to their Lordships great Wisdom and Justice shall seem meet:" As also upon the Answer of John Bailey, of Northleigh, in the County of Devon, Gentleman, Heir at Law of the said Sarah Bailey Widow, deceased, put in to the said Appeal; and due Consideration had of what was offered on either Side in this Cause. It is Ordered and Adjudged, by the Lords Spiritual and Temporal in Parliament assembled, That the said Petition and Appeal be, and is hereby, dismissed this House; and that the said Decree therein complained of be, and the same is hereby, affirmed. Dominus Cancellarius declaravit præsens Parliamentum continuandum esse usque ad et in diem Veneris, decimum septimum diem instantis Junii, hora undecima Auroræ, Dominis sic decernentibus. Message from H. C. to return the Bill for bringing the Murtherers of Capt. Porteous to Justice. 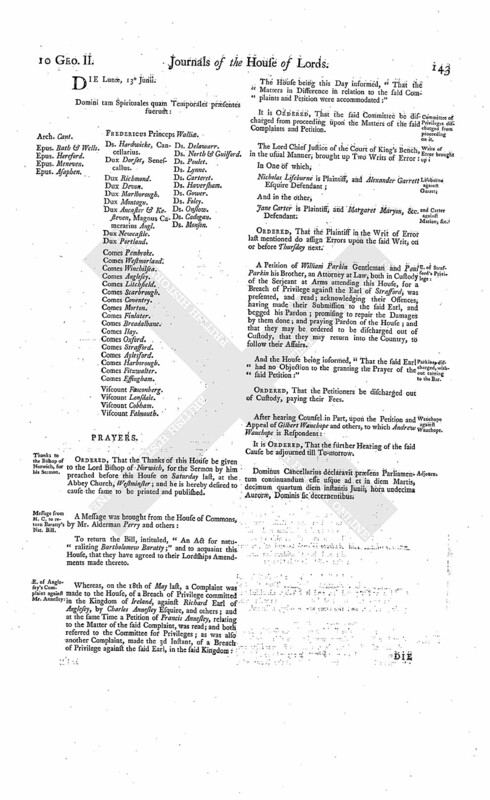 To return the Bill, intituled, "An Act for the more effectual bringing to Justice any Persons concerned in the barbarous Murder of Captain John Porteous; and for other Purposes therein mentioned;" and to acquaint this House, that they have agreed to the said Bill, with One Amendment; whereunto they desire their Lordships Concurrence. At the End of the Bill, add Clause (A). "And, for the more effectual discovering, apprehending, and bringing to Justice, any Person or Persons concerned in the said Riot and barbarous Murder, be it further Enacted, by the Authority aforesaid, That if any Person or Persons concerned in the said outrageous Riot and Murder shall, before the First Day of February next, discover and apprehend, or cause to be apprehended, any other Person or Persons, who hath or have been guilty of the said Offences, so as the Person or Persons so discovered shall be convicted of the said Riot and Murder; every such Person or Persons making such Discovery shall be freed and discharged from all Prosecution had, or to be had, concerning the same: And, as a further Encouragement to such discovering, apprehending, and convicting, of any of the said Offenders, be it further Enacted, by the Authority aforesaid, That any Person or Persons who shall, before the said First Day of February next, discover and apprehend, or cause to be apprehended, any of the Persons concerned in the said Riot and Murder, so as he, she, or they, be convicted thereof, shall have, and receive for every Person so discovered, apprehended, and convicted, the Sum of Two Hundred Pounds Sterling, to be paid out of any of His Majesty's Revenues: Provided always, and it is hereby further Enacted, That the Person or Persons making such Discovery, and entitled to such Reward as aforesaid, shall not thereby be disabled to be a Witness against the Person or Persons upon whose Conviction or Convictions such Reward shall become due; any Law, Usage, or Determination, to the contrary thereof, in any Wise notwithstanding." To acquaint them, that the Lords have agreed to the said Amendment. The Earl of Harborough reported from the Lords Committees to whom the Bill, intituled, "An Act for making navigable the River Rodon, from a little below a Mill called Barking Mill, in the County of Essex, to Illford Bridge, in the said County;" was committed: "That they had considered the said Bill, and examined the Allegations thereof, which they found to be true; and that the Committee had gone through the Bill, and directed him to report the same to the House, without any Amendment." Upon reading the Petition of Margaret Marion Widow, Defendant in a Writ of Error depending in this House, wherein Jane Carter is Plaintiff; praying, In regard the Plaintiff in Error has not assigned Errors within the Time limited by the Order of this House, that the said Writ of Error may be Non pros'd:"
It is Ordered, That the Petitioner do forthwith enter a Non pros. on the said Writ of Error, as desired; and that the Record be remitted to the Court of King's Bench, to the End Execution may be had upon the Judgement given in that Court, as if no such Writ of Error had been brought into this House: And further, that the Plaintiff in Error do pay, or cause to be paid, to the Defendant in Error, the Sum of Twenty Pounds, for her Costs, by reason of the Delay of the Execution of the said Judgement. 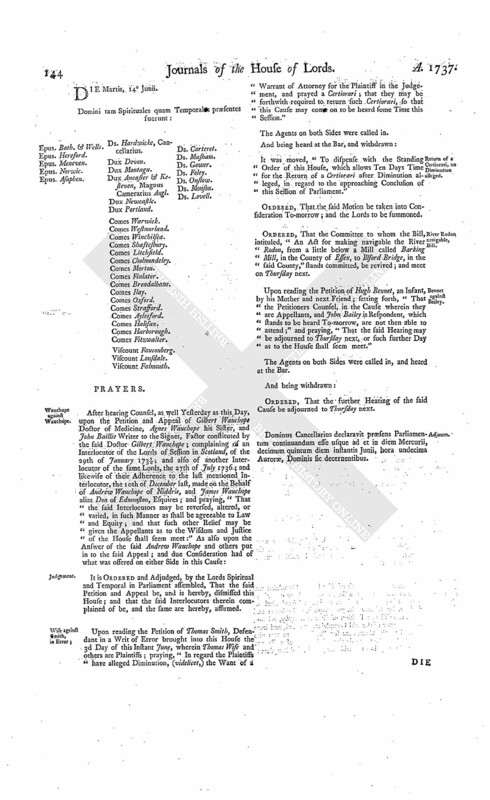 The House (according to Order) proceeded to take into Consideration the Amendments made by the Commons to the Bill, intituled, "An Act to disable Alexander Wilson Esquire from taking, holding, or enjoying, any Office or Place of Magistracy in the City of Edinbrugh, or elsewhere in Great Britain; and for imprisoning the said Alexander Wilson; and for abolishing the Guard kept up in the said City, commonly called The Town Guard; and for taking away the Gates of The Nether-Bow-Port of the said City, and keeping open the same." "Press 2. L. 33. Leave out from the Word ["dead"] to the End of the Bill, and insert Clause (A.) And be it further Enacted, by the Authority aforesaid, That the Corporation of the said City of Edinburgh do forfeit the Sum of Two Thousand Pounds Sterling, to be paid out of their Common Good, to His Majesty, by the Magistrates and Town Council of the said City; which said Sum of Two Thousand Pounds shall be applied to and for the sole Use and Benefit of the Widow of the said deceased Captain John Porteous." 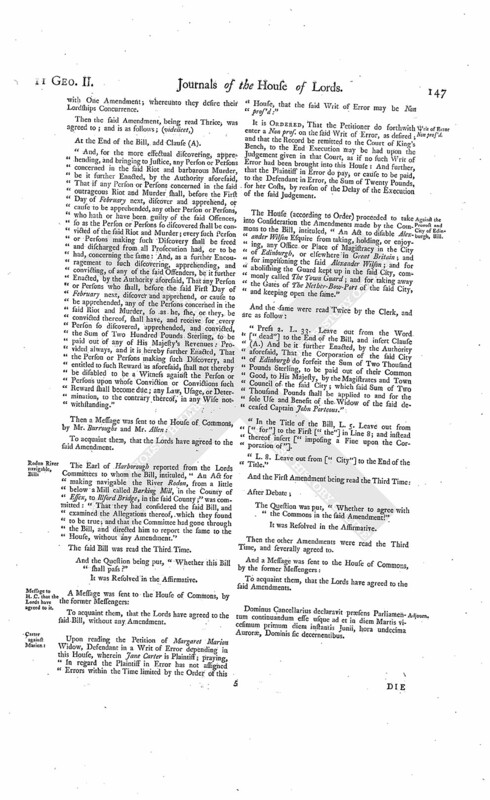 "In the Title of the Bill, L. 5. Leave out from ["for"] to the First ["the"] in Line 8; and instead thereof insert ["imposing a Fine upon the Corporation of"]. "L. 8. Leave out from ["City"] to the End of the Title." Then the other Amendments were read the Third Time, and severally agreed to. Dominus Cancellarius declaravit præsens Parliamentum continuandum esse usque ad et in diem Martis vicesimum primum diem instantis Junii, hora undecima Auroræ, Dominis sic decernentibus.